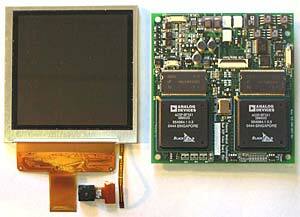 Bolton Engineering Inc constructed the Medical Image Processor around two Analog Devices Dual Blackfin Processors. One Blackfin captures an image from a VGA-size color CMOS imager using one of its PPIs (Programmable Parallel Interfaces), the other Blackfin outputs the processed image with a User Interface overlay to an inexpensive PDA-sized (320 x 320) color TFT LCD over one of its PPIs. The two Blackfins are linked together via their second PPIs. The image-processing algorithm -- designed and coded by Palomar -- is pipelined to divide the processing into several stages and processed by the four Blackfin cores. Each processor has 8megabytes of external Flash memory and 16megabytes of external SDRAM. Four A/D channels, four programmable LED current sources, several keyboard input lines, and a dozen general-purpose I/O lines interface to external system elements. 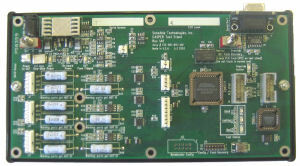 The system requires seven on-board voltages to power the Camera, Logic, DSP Cores, Memory, TFT Display and TFT backlight; the TFT display requires three of these supplies to be sequenced. Blackfin timers, coordinated with the Blackfin PPI LCD DMA data, implement the LCD timing control lines, significantly reducing the need for external logic. By synchronizing the image display to the image capture, the total latency from capture to display is kept to only two frames. Bolton Engineering wrote the specification, designed the schematics, obtained vendor quotes, designed the 10-layer circuit board, wrote diagnostic and driver software in 'C', debugged the system, and delivered six working prototypes. Palomar Medical Technologies was developing a handheld cosmetic laser surgical device and wanted to provide a real time enhanced image of the patient's internal vein structure. 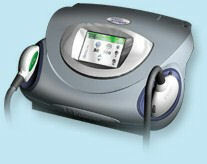 The system had to fit into an existing handpiece with minimal modifications, and needed to be smaller than 2.5" x 2.5". The system had to take minimal power, as there was no airflow and no space for adding a fan. The enhancement imaging software required significant processing capability.